On Saturday I led a workshop on Point Reyes about photographing waves. For this workshop, waves are what Alfred Hitchcock called a “MacGuffin”—a fun red herring that lets you get slip the real subject matter in under the covers of the spurious narrative. 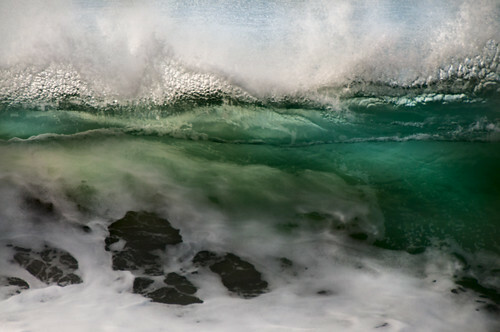 While the photography of waves is important to this workshop, so is photographic technique. 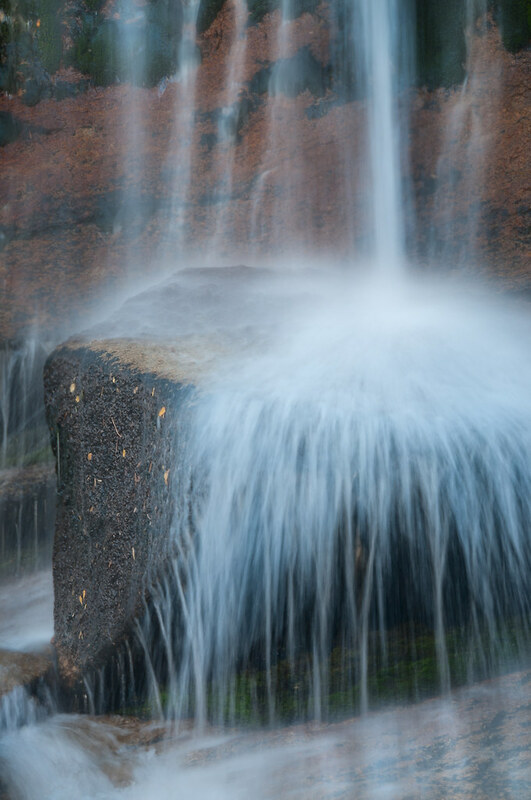 Specifically, using wave photography as motivation, case study, and example works extremely well to demystify shutter speed, motion, how changing shutter speed impacts the rendering of motion—and also to examine the relationship of exposure, aperture, shutter speed, and ISO. The workshop was full, with twenty people including two facilitators, and as I drove out to Point Reyes I became increasingly concerned about the foggy, wet weather. Later, after the classroom session, my fears seemed borne out. On Drakes Beach it was windy, cold, and raining—apparently no weather for photography of waves or anything else. A few intrepid workshop particpants headed out to the beach with plastic bags over their cameras. Others beat a hasty retreat to the restaurant at the beach for hot chocolate, and photographed the rain from inside the windows. I’m afraid that one or two photographers had enough—and left to go home. The hulking shapes of normally submerged rocks at low tide in the drizzle were fascinating, and some interesting photos were taken despite the moisture. Then the weather broke, and patches of blue began to appear. We continued with the workshop as planned, climbing up the Drakes Overlook, and then heading to South Beach for sunset. South Beach faces the open Pacific. 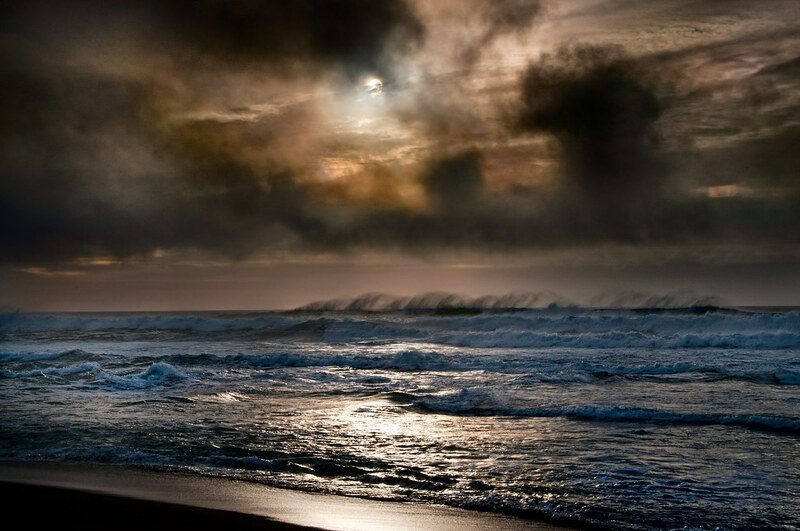 There was a strong wind, pounding surf, and dramatic lighting, as you can see in the shot at the beginning of this story, which was taken at 46mm, 1/125 of a second at f/29 and ISO 200, tripod mounted. Part of my strategy was to intentionally underexpose everything except the disk of the setting sun by at least several f-stops, then to restore the dark sections in the Photoshop Darkroom. I think everyone in the workshop enjoyed the wild, anarchic surf—although one of our number got too close to the surf and needed a change of clothing (her camera was fine). Thanks to everyone who particpated for their adventurous spirits and being willing to brave the elements. Despite what looked like a workshop disaster early on, it turned out to be truly great photography and communal fun. The experience also validated a trusim about landscape photography: if you are not out there when the weather is bad, then you won’t be there when the bad weather breaks—which is often when you find the best opportunities. Related links: Poetry in Motion; Harold Davis workshops page; What participants say about Harold Davis workshops. 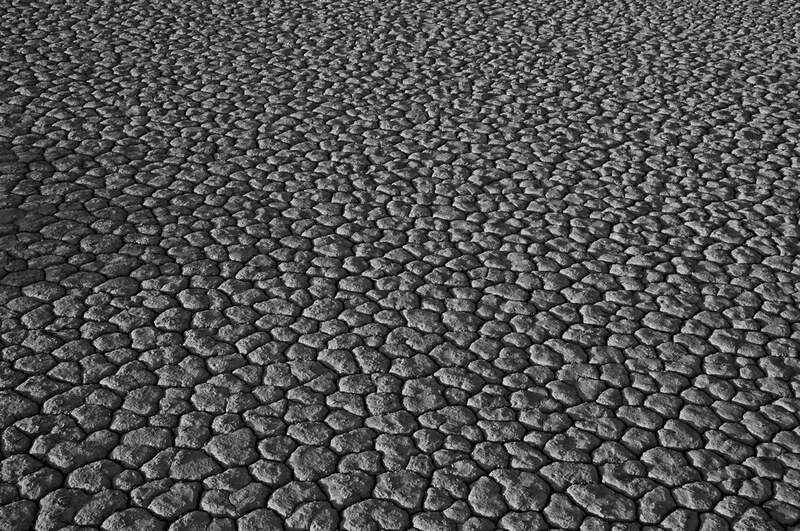 This is a shot of the Race Track—a dried lake bed in Death Valley—taken just as the sun was coming up. The rising sun provides a harsh side light that gives the baked mud “tiles” definition. At first glance the viewer has no idea about scale: Is this an extreme close-up or an aerial shot of a landscape? The shadows, apparently of shrubs, on the left of the image form a boundary—and give a hint of the intermediate scale of the view that I captured. Briefly noted: This is a high-key shot of professional model Amanda, exposed without flash to take advantage of the beautiful light coming through the window. Taking advantage of trends and opportunities with digital photography requires a change of attitude—as well as mastery of an entirely new digital tool set that has more to do with social media and marketing than with photography. The purpose of this new series of columns is to help you with both of these aspects using digital era tools to find an audience for your photography. 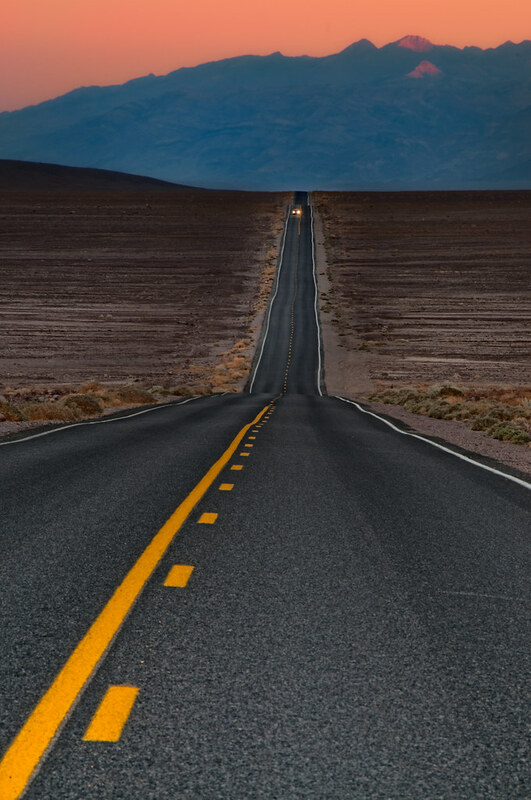 Join Harold Davis on this digital journey—he’ll be your guide through the sometimes perplexing digital maze while helping you find your unique photographic voice. 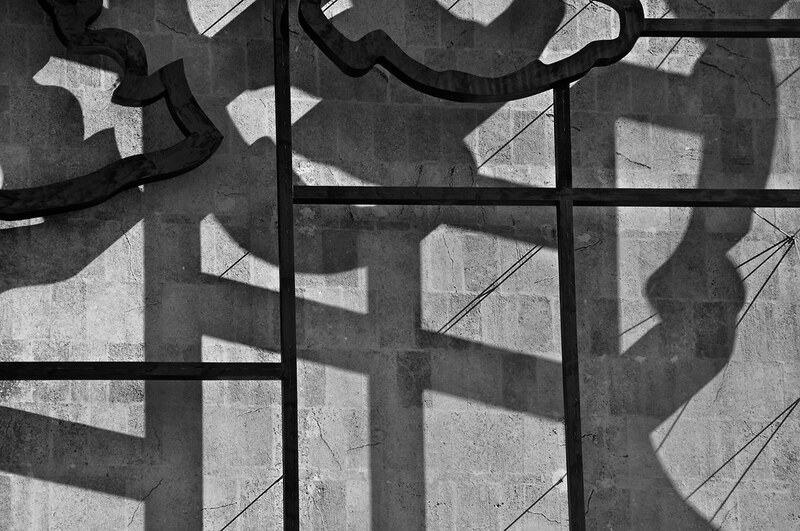 Read Finding an Audience for Your Photos: Intro. More Harold Davis on Photo.net. First light of morning: Eyes dry from dust, photographing all night, restless napping in the van while the shutter clicks. On the road: Day in the life of the night photographer, sunrise glinting on a few crags in the distant range. I stop beside the lonely road, assemble camera on tripod, and shoot this photo of the first car of the day heading for me in the cool of the morning before the sun comes up harsh and strong. 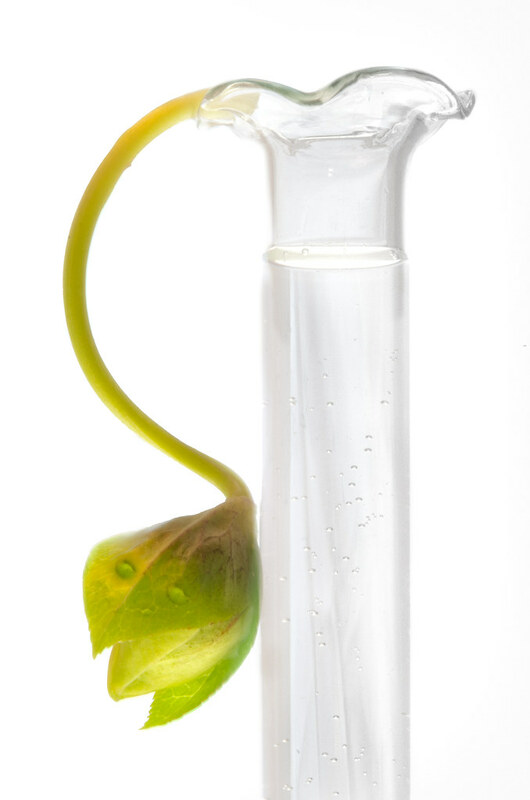 This is a shot of a hellebore blossom in a bud vase—or, as I like to think, escaping from the bud vase. The drops of water on the bud look almost like eyes, and the stem could be a tail. I placed the bud vase on a light box, and used a light tent to create diffuse lighting around this still life. The photo was somewhat overexposed to enhance the high-key look. In post-processing I duplicated the image, did a monochromatic conversion, copied the black & white version over the original, and used a gradient blend to desaturate the right side of the image. Briefly noted: A wonderful profile of my work on Daniel Fealko’s PhotoFidelity blog. 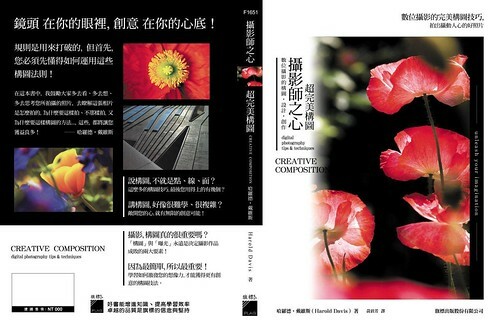 This is the cover of the Traditional Chinese (Taiwan) translation of Creative Composition. I gather that Traditional (sometimes also called Orthodox) Chinese uses visually richer characters than the abbreviated written version of Chinese used on the mainland. Since I am no Chinese scholar, if this impression is wrong please let me know. I find the choice of cover image (which differs from the original English edition) interesting. This selective focus image of poppies (shown on the right side above) always struck me as Chinese in feeling, which is why I named it Pagoda of Poppies. Apparently, someone in China agrees with my impression. 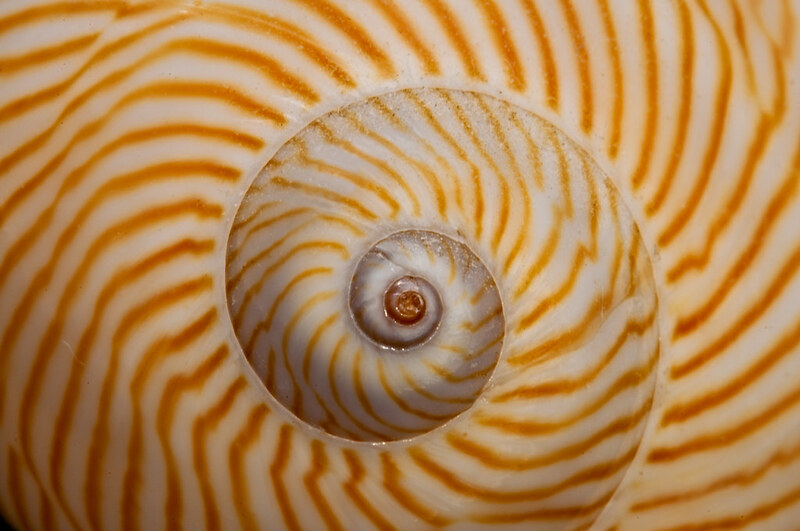 Shell Spiral 2, photo by Harold Davis. View this image larger. Briefly noted: This is another shell spiral, this one much closer of a very small shell lit from behind. Twisting, photo by Harold Davis. View this image larger. This is a hand-HDR blend of four images, shot on the narrow shoulder leading up to Angel’s Landing in Zion Nation Park. 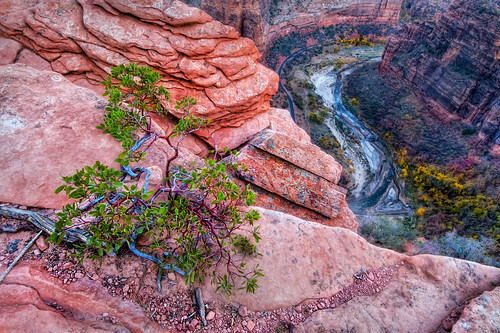 My interest was in the way the twisted, gnarled tree echoes the curves in the canyon so far below. Poetry in Motion, photo by Harold Davis. View this image larger. A wave is poetry in motion. Always moving, never the same twice, full of life—the wave is a fundamental force of nature, the shape behind light and sound. Over the weekend, I took a little time off and hiked down to Tennessee Beach in the Headlands with a friend. We left the parking lot in the fog, and ambled down the gentle trail the couple of miles to the beach. By the time we got there the sun was breaking through the clouds, and the scene was radiant. This was a day of fairly big surf, with interesting waves. I decided to concentrate on the movement of the waves. So that I didn’t have to think about my camera settings, and so that I knew I could “stop” the motion of the waves, I boosted the ISO to 400, put the shutter speed to 1/2000 of a second, and used the exposure adjustment control to underexpose by one f-stop. Putting the focus mode to manual, and focusing at infinity, meant I didn’t need to worry about focus lag. When the right wave came along, I was ready to catch it, backlit by the sun as it crashed on the steep shoals of the beach. Shell Spiral, photo by Harold Davis. View this image larger. 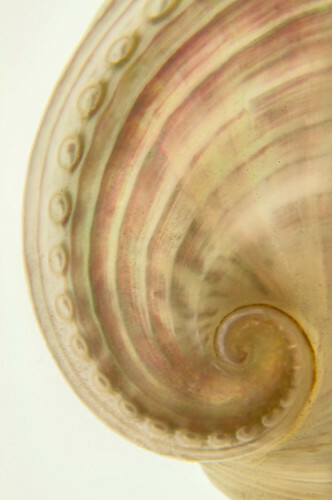 Spirals occur in nature, in architecture—and all over the universe from the incredibly small to the cosmically large. There’s nothing I enjoy photographing as much as a good spiral—for example, the one made by this tiny shell. Check out: my Spirals set on Flickr. Sea Urchin 3, photo by Harold Davis. View this image larger. 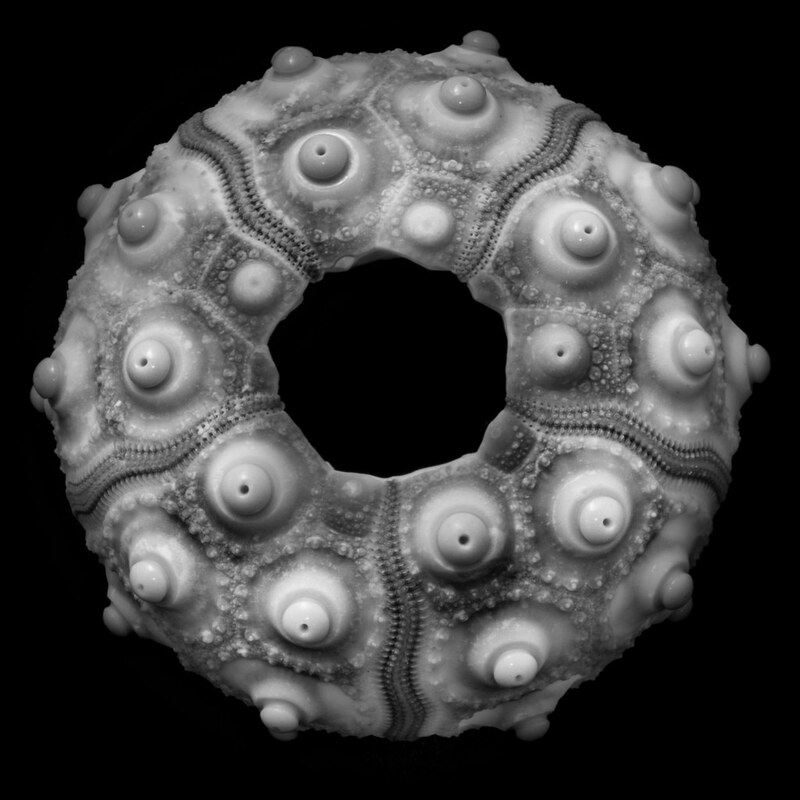 I’ve been photographing shells such as this sea urchin for a project the last few days. My friend Steven Christenson commented that this one looks like a “high brow fruitcake.” Amazing what nature comes up with! Compass Rose, photo by Harold Davis. View this image larger. A compass rose is a figure on a map or nautical chart used to display the orientation of the cardinal directions. You’ll find compass roses in functional devices such as, well, compasses—but also decorative compass roses have been around since the time of the Romans. Indeed, a beautiful compass rose helps give maps their visual allure. I made this attempt at a compass rose from seashells, primarily two sea urchins and a marine gastropod. The gastropod was flipped horizontally and vertically to create the cardinal compass points. 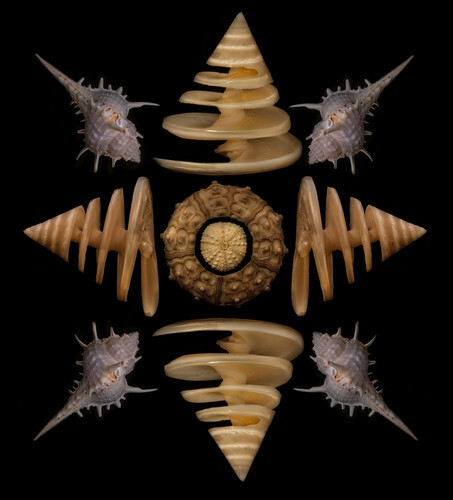 I then assembled the shells and their rotations in Photoshop on layers. Falling Water, photo by Harold Davis. View this image larger.